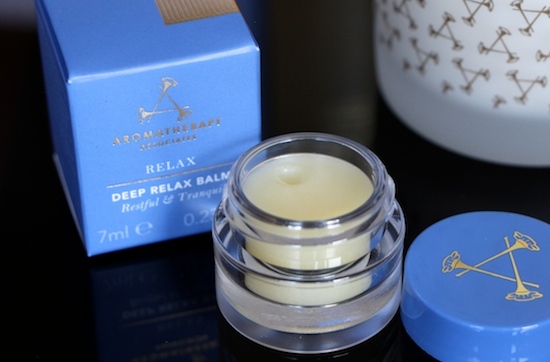 The launch of Aromatherapy Associates’ Deep Relax Balm is great news for me; I’ve often wished that I could enjoy the benefits of the Deep Relax oil blend without having to actually get into the bath or shower. It’s not always convenient to just hop into the tub when you need to de-stress (although I can’t recommend it highly enough, especially if you’re using the Deep Relax Bath and Shower Oil, which is my favourite blend, closely followed by Revive Evening, if I need to summon up the strength to go out for the evening after a long day working!) . It’s not always convenient to hop into the tub and, if you’re travelling, there’s no guarantee that your accommodation will even have a tub to hop into. So I welcome, with widely flung open arms, the introduction of a balm that captures the essential Deep Relax blend but that is entirely portable and quick to use. And Deep Relax isn’t limited to nighttime use – in fact, I’m beginning to realise that the most effective de-stress sessions can actually be during the day, without falling asleep. You actually reap the benefits of the moments of calm, rather than simply conking out. (Though I know that many people find it hard to sleep and would welcome the feeling of conking out.) My only problem is, during the daytime, that I get so relaxed I don’t want to actually do anything. I end up turning on my Kindle and reading novels all afternoon, with a quick catnap thrown in! So, use sparingly during the day and only when needed – in the evening, knock yourself out. Literally. Read more about sleepy beauty products here.